Let’s just say I’ve been hibernating. A few things have been going on, as we plan for this next year and some improvements to our property and our gardens, but we are mostly in hiatus. I have some new arrivals to show you, and there is a list of more to come, but I’ll save that for later. I’m not here to talk about just me. Or just you, and a problem you may have had or may start having or may have nightmares of having. It’s about the hens. I started suspecting it sometime in January, as we’d get a stray egg here or there and then nothing. The Delawares laid for a week solid, and the Welsummers were the only ones to give us a handful of eggs a week as winter dragged on. We ate all the eggs that were put up in the freezer, and I have been guarding our now half-dozen eggs carefully. They’re valuables. When, like us, you can easily go through 2-3 dozen eggs in a week (breakfast, baked goods, pasta)–eggs are key sustenance. But the eggs would disappear here and there. Sometimes I’d see a piece of a shell, but I would also find an egg for me. It wasn’t so common I was worried. Just common enough to be a thought–maybe it wasn’t an accident, so to speak. Then I would find shells on the ramp up to the coop. A stray shell in a corner, if I looked hard enough. I think one of my chickens is eating my eggs. And I think it’s one of my hens. And I think, if I find her, I’m going to eat her. We have been thinking of how to get those pesky Welsummers to lay in the boxes, and not on the ground. And how to get the egg eating to stop, and to hope against all hope it’s just one hen and she hasn’t taught the others. So on Saturday we laid the pine shavings on real thick. We picked out the spots where it looked like some old egg damage had been done. We bought more packs of golf balls and laid them 2-3 in each nest box. 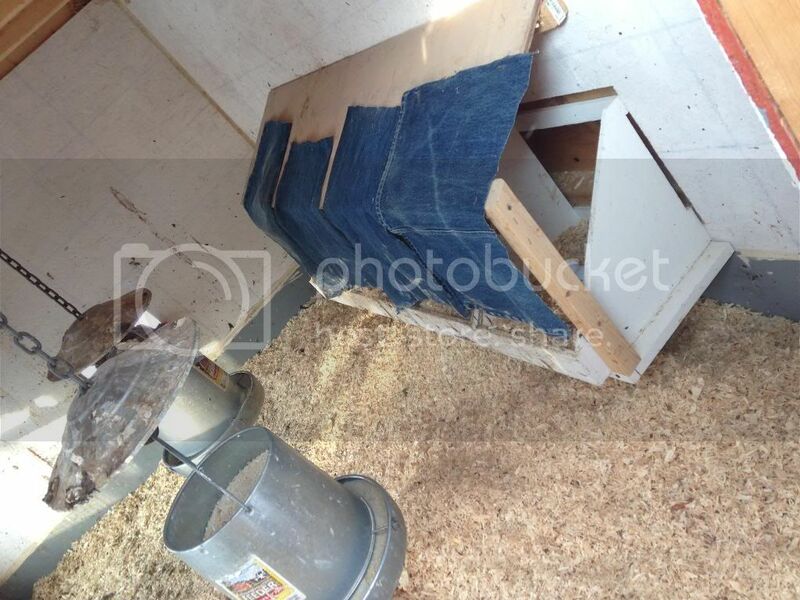 We cut up old jeans and stapled them to the nesting boxes, a long overdue move. Don’t judge the poop. We keep a clean coop, but I can’t spend every cleaning day repainting the walls to keep up with these messy birds. It felt right. And soon after we did this, we got an egg. Left the house, came home–one more egg. It didn’t seem right. An Ameraucana egg and an Ancona egg, but my Welsummers should be laying. My Delawares should be laying. My Marans are much slower. Then I looked closely and in the fresh pine shavings, egg yolks. No shell, but surely some egg yolk from some nasty hen ruining my breakfast. So, I’m sorry to say that, unless she stops herself, as soon as I figure out which hen (please say it’s just one!) is eating my eggs, she’s going to be dinner shortly thereafter. How can I be expected to hatch chicks if I can’t even eat breakfast? Note: If you, like me, weren’t proactive and haven’t covered your nesting boxes, I highly recommend it. We dragged our feet until we finally had a pile of jeans. Even aside from the egg eating, it was a smart move that we should have done a long time ago. Jeans are sturdy enough that they should hold up to the environment, and this way we are reusing something that would otherwise go to trash (too many holes to be worth donating or saving). No pics this time; I don’t think you will want to see them. As many of you may be experiencing, we’re getting a lot of blasts of arctic cold, and a lot of unseasonably cold weather. It was 3 degrees when I woke up this morning, which is usually unheard of in this area–at least not multiple times a year. Our highs rarely get above 30. A 40 degree day is downright toasty. In a normal year, 40 would be a healthy daytime average. But, well, this wasn’t a normal year! And, of course, rather than kindling on those warm 30-degree nights last week, my new American doe (Cissy), kindled on the coldest night this week. So when I got up this morning and rushed down to water the rabbits before anyone else, this first time rabbit momma’s heart sunk as she looked into her first time momma’s cage. Even if it had been a 20-degree night last night, or possibly even a 40-degree night last night, it wouldn’t have saved these kits. This first time, she kindled straight on the wire. No fur in her nest, no fur on the wire, no nothing–even though she’d tamped down her nest. I have heard of many people who have had successful litters in cold that’s colder than this. What happened was a risk for many or most first-time rabbit moms. But that doesn’t make it any easier. I am waiting on my Silver Fox doe to see what she does. If she kindles and they survive, it will add a little light to this day. To start the year off, we’ve gotten a new Facebook page. So if that’s your thing, feel free to head on over! This blog is still my primary focus to talk it all out, update on what’s going on and to post about our projects, but I think the Facebook page will allow us to access more people and connect with more friends (new and established alike). I will likely also use it to link to articles or recipes I find interesting. An update coming soon as I try to learn how to palpate my does! Yes, that’s does with an “s.” A picture of our new bunnies will come with that post too. So, I figured before going out to palpate the rabbits and take some pictures on this last day of 2013 (and give you some long overdue updates not about our craft days! ), I would give you a list of some more blogs to read. I’m not formally calling it an award, though you’re welcome to, and I’m not really following the directions, but–I’m just paying it forward. These aren’t anywhere near all the blogs I follow or all the ones I enjoy. Generally, these are the people who post more frequently (thank you for entertaining me!) or who I interact with a bit more. Something about their blog or one of their posts intrigued me and makes me smile every time I see one of their posts. There’s lots more great people out there. It’s a great community. Hopefully I’ll be able to start chatting with you all more! 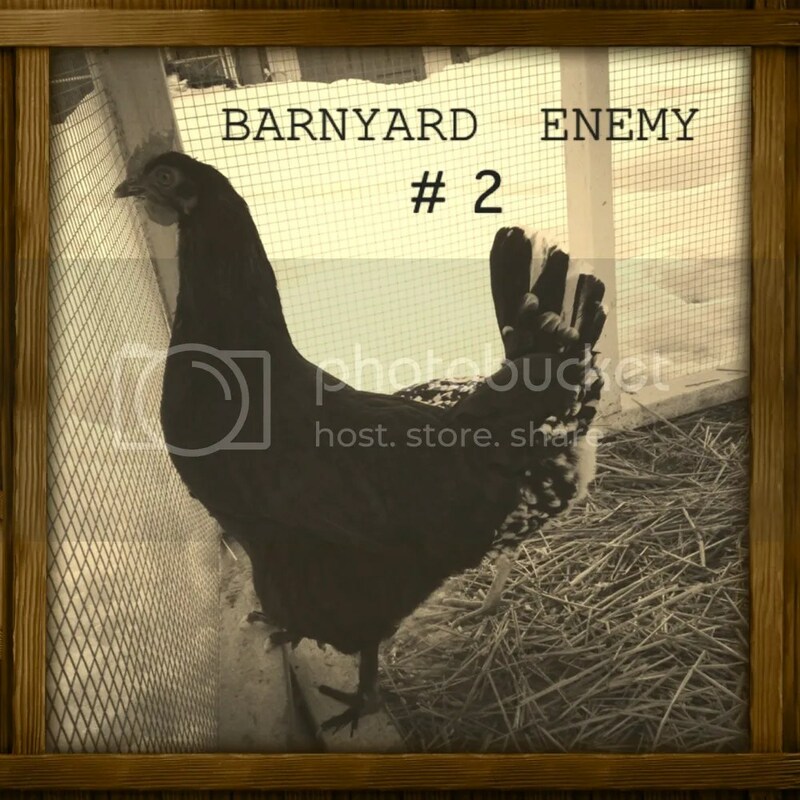 The Tiny Homesteaders – This was one of the very first blogs I found and one of the most interesting as far as “working with what you’ve got.” I’ve learned a lot from his experiences, be they good or bad. When Did This Become a Farm – This is a great blog if you’re getting into rabbit keeping, just because you get to see a bit of the day-to-day from another view. There seem to be few blogs about raising meat rabbits out there, and especially not one that keeps you so up-to-date and in-the-barn so-to-speak on what they’re doing. I know I haven’t been very good about it (to change soon). 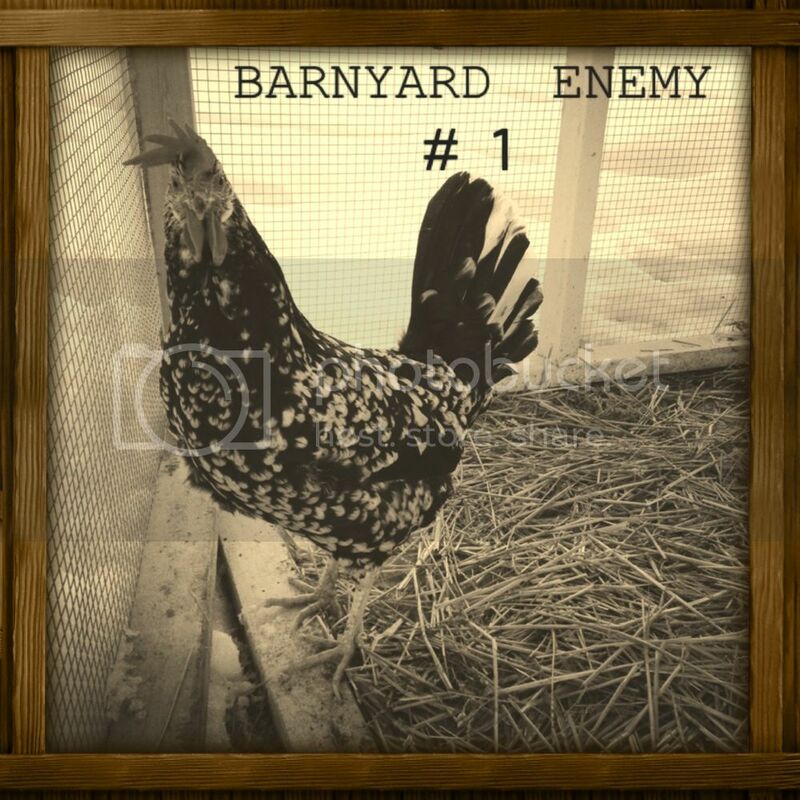 Hey Lou Writes – She writes, she has chickens, she takes risks, she likes Harry Potter. Sold. Pleasure Pastures Farm – The dogs drew me in! The Electronic Homestead – I had to update to include her blog! I admit, it’s gotten harder now that her posts don’t show up in my feeder any more, but it’s interesting to see what she’s up to every now and then! With the few minutes left on this day, I want to wish you and yours a Merry Christmas. I hope it was beautiful and filled with love, regardless of if you celebrated. I know, mum is the word lately from our side of the world. I’ve been trying to get a handle again on my health. Not that there’s anything too seriously wrong with it, just a lot of mismanagement in the last year. And I’m paying for it dearly. So, while I go back to a sugar-free lifestyle, a drink-lite lifestyle, and one day soon a more active lifestyle, I’m getting ready for that lovely day called Christmas. And it’s coming up FAST! As we get deeper into the holiday season, I get more and more frustrated. It’s my favorite holiday. More discussion on why and why you shouldn’t balk at that (it’s more a sentiment/spirit-of-the-season thing than a commercial thing) in another post. As you saw with my last post, this year’s big present project is crochet. It’s my first year actually finishing crochet projects and I’m learning a lot. I’ve finished four hat and scarf sets and two neck-warmer type pieces, plus a scarf for Mike in a brown scratchy wool. And with only 15 days left until Christmas, I had a plan. You see, a little over 5 years ago, I was going back for my last semester in college in September of ’08, and I told myself I was going to make Mike a blanket for Christmas. 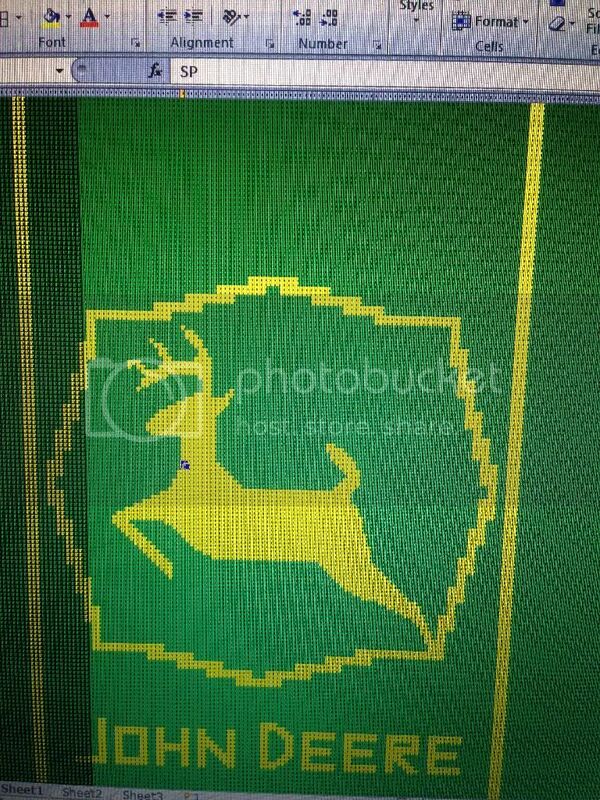 A John Deere blanket. I don’t think it ever got more than 4 inches wide, and I told Mike it was a bust after the holidays. He’s never let me live it down since. So, to make up for it, I have this big vision. A John Deere blanket by Christmas. Me being me, I like to have a plan, preferably one with an unrealistic deadline. Remember–I’m learning. So every time I feel close, like it might happen, it gets further and further away. First, I’m at perhaps 11 inches wide with 2 days’ worth of work (approx. 8 hours total). I’m aiming for a 60-inch wide blanket, and by that count I need to get at least 2 hours in every night before Christmas morning. 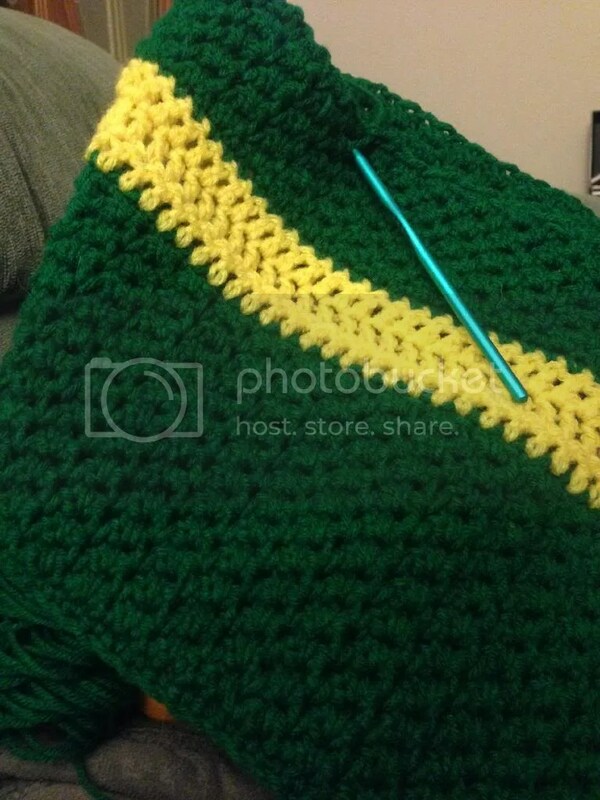 That’s just for a blank green blanket with two yellow stripes. I admit, I don’t know how to crochet designs in a blanket as I go, so I was going to do a surface stitch. Then I learned more about that, too, and realized it will leave an ugly backing, even if a pretty front. So I will need to sew a back to the blanket to make up for it. Have I mentioned it took me an hour to get my sewing machine up and running last week? Let’s just say, Mike may get his plain blanket for Christmas, with a printout picture of the final dream. Because for now? I’m in way over my head. But, below you can see the start of what I have done and the pattern I created for myself to try and center the surface stitching properly on the blanket when I get there (I needed it to know how many rows I needed). I did this manually in Excel before I realized that there is software that will do this for you. Oh, and did I mention that in addition to the blanket, I’m making pajamas and still need to make bags (trying to go green-er this year!) for presents under the tree? WAY over my head! Well, I did it. I finished my first crochet pieces! You see, this is a big deal. I’ve been trying to finish my first crochet piece for almost 20 years. Yes, you read that right–20 years. Twenty years ago my grandmother (the one who reminds me of frogs and soil and azaleas and drawing trees outside the bedroom window) was still alive, and I wanted to do everything she could do. She taught me to crochet and latch hook and all sorts of other crafts when I was a kid. She died when I was 11, and that year we started a project together. She was teaching me to crochet a pair of mittens in a soft white fabric with silver threads throughout. We almost finished the first mitten together, and then she was gone. I could never finish it. So these projects are for my grandmother. They’re for me, they’re for my family, they’re for my sanity (I was very stressed), but really–they’re for her. And so will be every thing I crochet throughout my life, which will hopefully be many more. Last Thursday some pretty strong winds came through. At night, we could hear the flag hitting against the house and trees in the area snapping. But we had long ago taken out the pines that could have taken out our house. We didn’t think much had been affected. Then, Friday morning. I went outside to an awful sight. Not only had he cut his hair, but he had shaved off his entire beard and mustache. And I hadn’t even noticed. But I suppose that I have gotten pretty used to the way things look around here. Not on a conscious level, as I don’t look at the beehives every day–at least not in a way that I ever took note of. Apparently, I can be more attentive than I thought, because when I went to let the younger chicks out, I stilled. Something was off, and I immediately knew what. The garden hasn’t been dismantled yet. There wasn’t much I could do myself in the morning and Mike was already at work (it being 8am). Mind you, I’m still a bit terrified of our bees, but I didn’t want them to die. 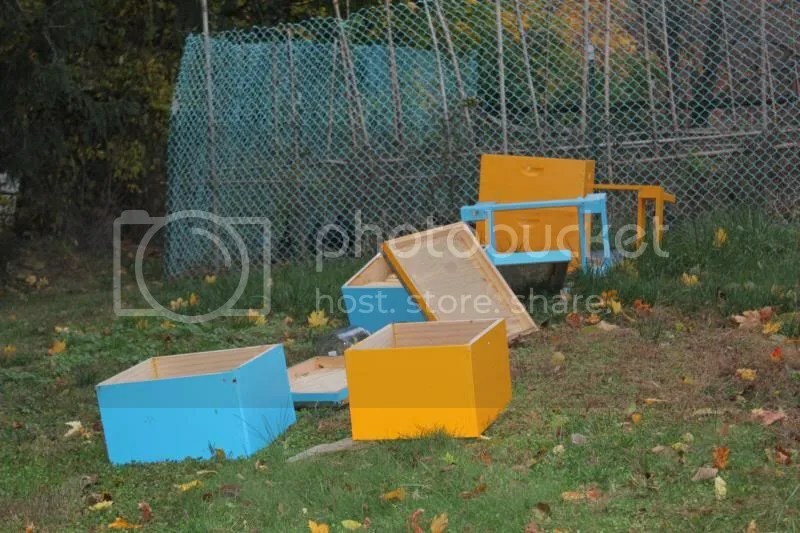 So I slipped the outer covers over each hive, and at least saw a happy sight: Even though the blue hive had been completely flipped upside down and the frames were falling out, the hive was alive. And that one box that didn’t get filled all season (we need to replace our queen) was overtaking the entire box. Not only were they surviving in the cold and the wind, but the hive was thriving. Well, I covered them up and when Mike came home we had to take care of the rest. I have no pictures of our later work because it was cold and getting dark and, really, I didn’t want to spend more time with the bees than needed. Mike managed to work on the platform for the beehives, to make it more stable. The stand legs are now screwed to a piece of plywood and the boxes ratchet-strapped to the stands. The yellow hive (which fell straight down) was easy for him to work on himself. Getting the blue hive right-side up was more difficult. Remember, I have a terrified respect for the bees. Luckily, in this weather, I was able to wear my winter work bibs (unfortunately a nasty dark brown) and stay warm and doubly protected. With a bit of ingenuity, we were able to get the frames of the blue hive inside by putting a piece of plywood underneath. Then the very careful, very slow flipping of the box before Mike picked it up and put it back on its stand. Hopefully we will not have this problem again. And, surprisingly, the blue hive we didn’t think would make it to winter, let alone through it, looks to be the strongest. And our yellow hive–the hive that survived against all odds multiple times–may be abandoned. We didn’t see any bees, and getting as close as I could in a beekeeping hat, I couldn’t hear any buzzing. The hive may be empty or extremely weak or perhaps just very down deep. 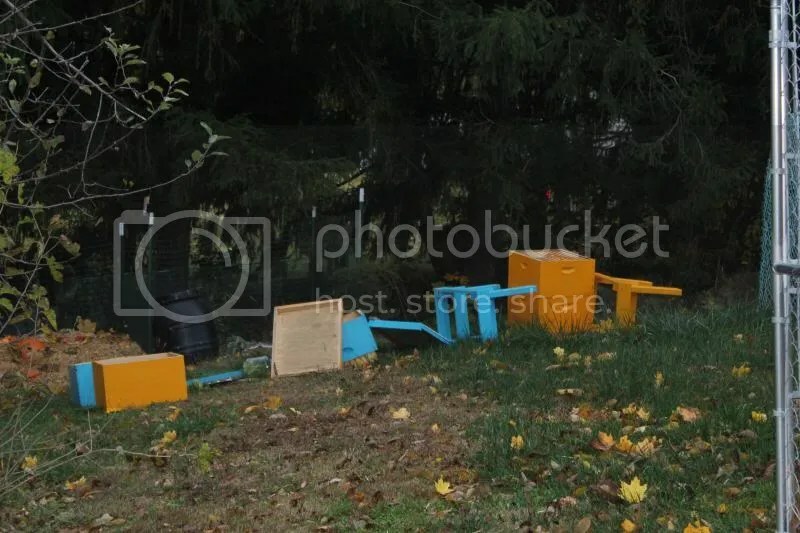 However, after flipping hives upside down, with wind and 40-50 degree weather, and having dead bees all over our jackets and pants, we weren’t about to find out the status of the yellow hive on Friday. I suppose that will be our next adventure when swapping out sugar syrup. There’s never a dull moment around here!